The route involves hills and some long inclines - but at least each uphill is mirrored by a freewheel downhill! This is one of a number of local castle-themed cycle routes from Llangrove which can be combined with others also published on this website. The routes make use of quiet lanes and National Cycle Network routes whenever possible. Some routes include sections from the official 'Four Castle Cycle Route' which incorporates Skenfrith, Grosmont, White and Abergavenny Castles. Routes on this website include additional castles - Pembridge, Monmouth, Goodrich and Raglan - all within easy reach of Llangrove. START at Llangrove Primary School entrance and contine along Llangrove Road, passing the Royal Arms Inn on the left, to the T junction. Turn left towards Welsh Newton and follow the up the hill then downhill to the T junction with the A466 beside Welsh Newton church on the right. passing Pembridge Castle on the right. This late 12th century castle is a private home and not open to visitors; nor is it part of the Three Castles route, but is an attractive and interesting landmark. then Skenfrith Castle can be seen on the right. Turn right towards the castle. Skenfrith is a small community with church, village hall, remains of former mill buildings and a dilapidated mill wheel adjacent to the castle. A small village refreshment shop opens during peak periods during the summer months. Cakes are also on sale in the church. Continue along the same lane to the right of the castle and church, passing over a small stream, Norton Brook, and follow the lane as it bears to the left before meeting a T junction beside Norton Court. Turn right onto the B4347 and follow this quiet lane across open countryside with panoramic views for 4.2 miles enjoying the views and easy cycling. On approaching Grosmont, the road bears to the right over a small stream then rises steeply into the village, the first steep hill of the ride. The lane leading to Grosmont Castle is on the right as you enter the village. Grosmont Castle is open at all reasonable hours with free admission and the accessible tower provides a viewpoint over the village. Leave Grosmont Castle lane, turn right onto the B4347 through Grosmont village, pass the Angel Inn and town hall then turn left (avoiding Poorscript Lane). The lane descends into a wooded area and crosses Tresenny Brook. Continue to Hoalalbert Farm buildings on the left, opposite which is a lane to the right bearing a Three Castles route sign. Stay on the same lane, bracing yourself for the long and steady uphill climb but taking comfort in knowing the views at the top make it all worthwhile and that this is one of the toughest sections of the route. Approx 2.5 miles after leaving Grosmont, join the main road on the right and continue 0.3 miles to take the first turning on the right along a narrow lane which soon bears to the left then continues between hedges before emerging on the B4521 at Cross Ash. (If you miss this turning, just continue to Cross Ash and turn right onto the B4521.) On meeting the B4521, turn right and follow this road for 1.6 miles then turn left following the sign to White Castle Vineyard. Pass the Vineyard on the right and continue for a further mile along the same lane to White Castle. Access to White Castle is now free of charge during daylight hours, year round. There are bike racks outside and picnic areas within the grounds. Leave White Castle along the entrance lane, ignoring the earlier lane on the left opposite the cottage. Instead, with White Castle Cottage on your right, continue along the lane passing Upper White Castle Farm on the right and enjoy the steady gradual descent. After 1.35 miles, you will pass the Old Court manor house on the right, all that remains of which now is a bridge over the stream, a former moat. and continue for 4.7 miles, passing Rolls of Monmouth Golf Club on the right, pass through the Hendre and take the next turning on the left, signposted Newcastle and Llangattock. Pass the Barn and associated buildings on the right, continue for a short distance then take the first turning on the right following the hedged lane between open fields to each side. Ignore the fork in the road and lane to the right to New House and follow the fork to the left and continue to the T junction with the B4347. Turn left onto the B4347 beside the white house on the right and new(ish) brick house on the left then turn almost immediate right onto the narrow hedged lane. The lane bears to the right at a white pebbledashed cottage then meets a further country lane at another T junction. Turn left beside the stone cottage on the left (with the white cottage, phone box and bus shelter now to your right) and continue down this lane through St. Maughans village towards St. Maughan's Green and Trigates (Tregates) Bridge (the spelling varies on different maps and signs!) then take the first turning on the right, with the width restriction signs, to Trigates Bridge. This is a pleasant gradual descent - enjoy it because it's soon followed by a series of long inclines! Trigate/Tregate stone bridge crosses the River Monnow after which the lane ascends quite sharply before bearing right towards a series of 4 long hills with stunning panoramic views to the right, including looking back on the lanes you've followed. There are a few areas in which to take a break, gulp down a drink and admire the views before embarking on the next hill after which there is a very welcome downhill roll to Welsh Newton and the A466. Turn left onto the A466 towards Monmouth then turn almost immediate right to Welsh Newton at the memorial outside the church. Follow the lane uphill then enjoy the last 2 miles of flat riding and freewheeling before turning right at the sign to Llangrove, passing The Royal Arms on the right returning to Llangrove Academy school to complete the ride. 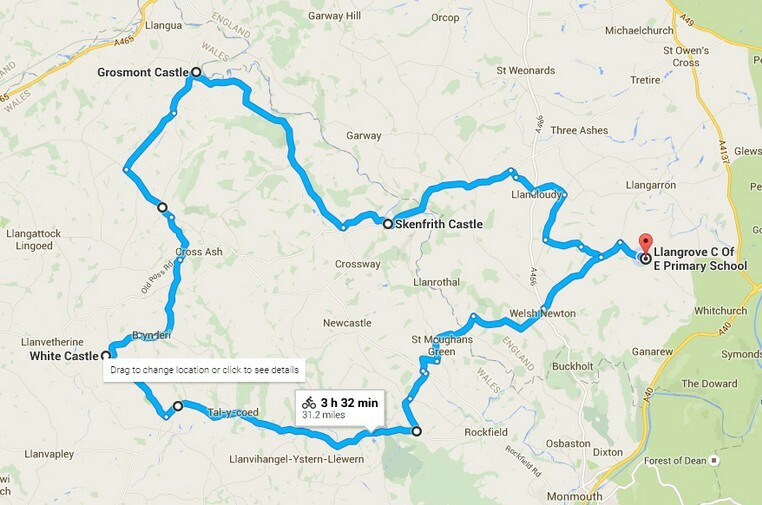 This route is intended as a guide to some of the local quiet roads and lanes around the Llangrove area. No liability can be accepted for any errors or omissions. To print a copy, right-click and select 'Print'.